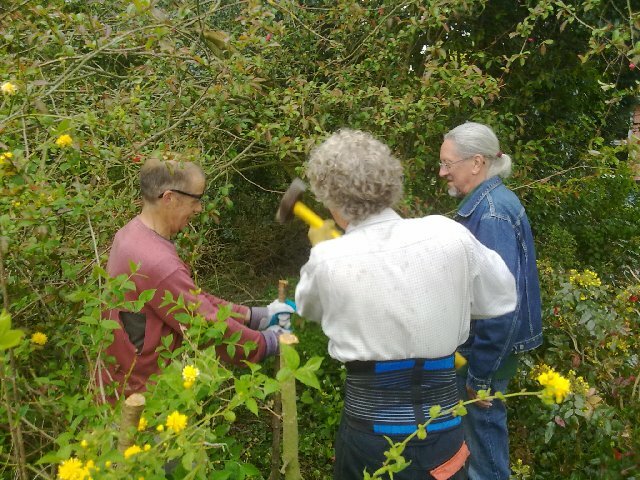 It just so happened that the five of us who turned up at Richard’s on Wednesday morning to learn how to do dead-hedging with Paul were all over 50, and so the title of this post was the ad hoc name we came up with for that morning’s grouping. 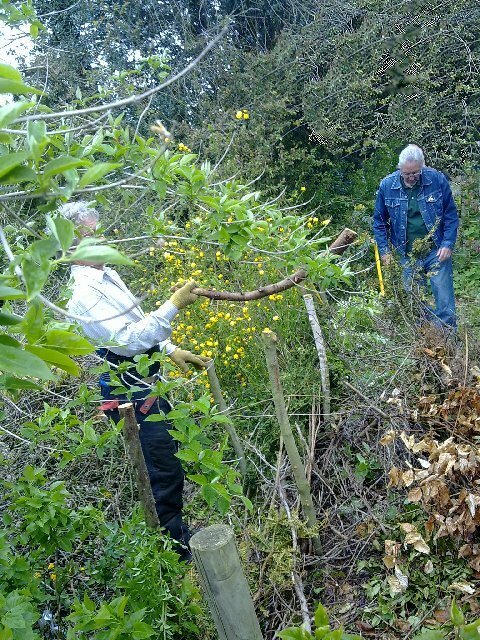 However, anyone of any age was welcome to join the new Transition social enterprise NR35 (NR = Natural Resources and NR35 is the local postcode) practical dead-hedge laying session. This involved laying out and hammering in stakes staggered along a boundary of about twenty-five feet, and then placing and roughly weaving in branches and twigs from recently coppiced trees between the stakes. Making a hedge in this way would not only provide Richard with a decent boundary, but create a refuge for wildlife. Birds like wrens will often build their nests in dead hedges. Tony found an old nest rather larger than a wren’s, which we placed in the hedge once we’d finished. This was the first time dead-hedging for all of us except Paul, who is a professional tree surgeon, and who taught us with consummate calm and patience. I asked everyone how it had been for them. Cathy: Well, it uses up an amazing amount of material you might think would be difficult to dispose of. And it’s delightful doing it with others. Nick: It’s hard work and it makes you sweat, but I’m surprised how easily we managed to get a good end-product (the hedge), in the space of 2 hours. And it’s brilliant we can go away and do it ourselves now. Tony: Working as a team is really good fun. And it’s satisfying to start off with all this dead material and end up with a hedge. Me: I found the whole morning instructive and really good fun. I noticed that being physically engaged in building the dead hedge you got into a kind of rhythm with everyone- I would find my hands often knew just what to do. It would have taken forever to do it from a book. Part of dead-hedging is jumping up and down on top of the laid branches when they’re at a certain height. Cathy and I held hands and pogo-ed up and down together. Later, I realised that over the years I’ve frequently bounced up and down at our events! Just because you’re over 50 doesn’t mean you’ve got no bounce! Or that you can’t learn a new practical skill in the course of a morning in a congenial atmosphere with fellow reskilling dead-hedgers. For more information on Sustainable Bungay’s NR35 Natural Resources group, see here.